CheapThrills: The Flip Video transforms you into a reporter, instantly! The Flip Video transforms you into a reporter, instantly! First - Happy New Year everyone! 2008 is gonna be intense and awesome. 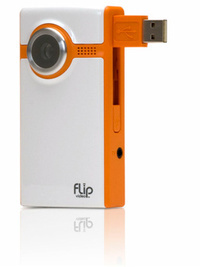 Second - I got a handy little gadget for Christmas – a Pure Digital Flip Video Ultra. Basically, it’s a camcorder for people who hate all the directions and buttons and headaches associated with electronics. In fact, the Flip Video only has 8 buttons. Total. And they’re all pretty much right next to each other (HORRAY!). This camcorder also features one key addition: A USB connection. Why hasn’t anyone thought of this yet? Slide down a little lever and the USB arm just flips out. It looks like a thumb drive. Plus, the installation software is built right into the device. Very handy for bloggers, podcasters, vloggers, and aspiring YouTube superstars. Now that I’m keeping this little Flip in my purse, I have begun to fancy myself an undercover reporter. So expect some live-on-the-scene breaking news coverage comin’ at ‘cha in the New Year. And third - Tomorrow I will post Slava’s guest blog. I’m sorry for the delay—I blame the holidays (easiest scapegoat ever).